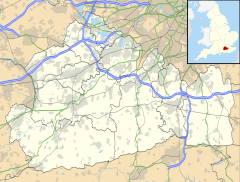 Hascombe is a village in Surrey, England. It contains a large cluster of cottages and country estates, St Peter's church, the village green, a fountain, pond, a central public house and is surrounded by steep wooded hillsides. Above the village is Hascombe Hill which is the site of a ruined hillfort built by the ancient Britons and occupied by them during the 1st century BCE. The word "combe" is derived from cwm meaning "valley" in the Welsh language and this may indicate that the population of Hascombe remained predominantly Brythonic for some time after the surrounding areas had been populated by Anglo-Saxon settlers. The name of the village is thought to come from Hægscombe meaning valley of the witch or "hag" in Old English. The village was not mentioned by name in the Domesday Book and it is thought to have been part of the manor of Bramley. "Whosoever will let him take the water of life freely". Inscription on the fountain at Hascombe built in 1877 by Edward Lee Rowcliffe in remembrance of his brother Henry. St Peter's church was rebuilt during the mid-19th century, but retains its medieval screen, made from Jerusalem olive trees and featuring elaborate carvings, and a font dating back to 1690. Poet Laureate Sir John Betjeman described the church as "a Tractarian work of art". The damming of a stream in the 15th Century created the Church Pond. Hascombe's natural fresh-water spring attracts many visitors: the fountain itself was commissioned in 1887 by local landowner Edward Lee Rowcliffe as a memorial to his late brother. A promontory that adjoins Hascombe Hill from 1796 to 1816 Hascombe hosted a station in the shutter telegraph chain which connected the Admiralty in London to its naval ships in Portsmouth. Hascombe is in a ward, Bramley, Busbridge and Hascombe, which has much higher than average home ownership than the South East Region and nation. Current and former residents include the film star Dirk Bogarde; Russian businessman Boris Berezovsky; former member of The Jam, Bruce Foxton; television presenter Anthea Turner; boss of McLaren F1 Formula One racing team, Ron Dennis; and broadcaster Chris Evans. It was during a stay at Hoe Farm in 1915 that statesman and future Prime Minister Sir Winston Churchill learned to paint. The Surrey Hills AONB, one of the many natural landscapes of the county, which includes this parish contributes much to the county's mean high level of domestic incomes. ^ "Civil Parish population 2011". Neighbourhood Statistics. Office for National Statistics. Retrieved 7 October 2016. ^ The White Horse architectural Grade II listing. Historic England. "Details from listed building database (1260891)". National Heritage List for England. Retrieved 6 March 2015. ^ Historic England. "Details from listed building database (1261122)". National Heritage List for England. Retrieved 6 March 2015. ^ Key Statistics: Population; Quick Statistics: Economic indicators. (2011 census and 2001 census) Retrieved 27 February 2015. ^ Penny Churchill. "Country houses with history". Country Life. Retrieved 4 January 2013. ^ "Surrey's richest 50 2009: The top ten". Surrey Life. Retrieved 4 January 2013. ^ "Don't lose the plot". The Daily Telegraph. London. 8 August 2005. Retrieved 4 January 2013. ^ Thornton, Philip (27 September 2003). "Surrey 'stockbroker belt' tops UK house-price list". The Independent. London. Retrieved 24 May 2010. Wikimedia Commons has media related to Hascombe. This page was last edited on 28 December 2018, at 16:32 (UTC).